They even have grain on their flag. 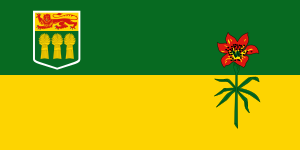 Saskatchewan is a large, flat rectangular province of Canada; politically, both conservatives and socialists tend to do well there, but not liberals, since Alberta and Saskatchewan have yet to forgive the Liberal Party for meddling in their oil industries. It grows a great deal of grain. With a population of only one million people, it is home to only 3% of Canadians. It has some oil, but not as much as Alberta. It is the world's largest supplier of both uranium and potash, which will come in handy if it ever becomes possible to fertilize and grow organic nuclear weapons. ↑ No, really. It comes as news to some Canadians that people actually live in Saskatchewan. It comes as news to most Americans that there exists a place called "Saskatchewan", never mind that people live there. This page was last modified on 3 March 2017, at 16:33.